Cosequin Equine Powder (Nutramax)1400 grams (Original Formula) contains a patented combination of low molecular weight Chondroitin Sulfate, Glucosamine HCL and Manganese Ascorbate for optimal functioning of your horse's skeletal joints. Each level scoopful (3.3 grams) contains 1,800 mg. Glucosamine HCL, 600 mg. Chondroitin Sulfate and 120 mg. Manganese Ascorbate. Dosage: Initial 4 to 6 weeks feed 3 level scoops twice daily for horses up to 1,200 lbs. Horses over 1,200 lbs. feed 4 scoops twice daily. For maintenance feed 1 to 2 scoops twice daily depending on the horse's body weight. Scoop included. 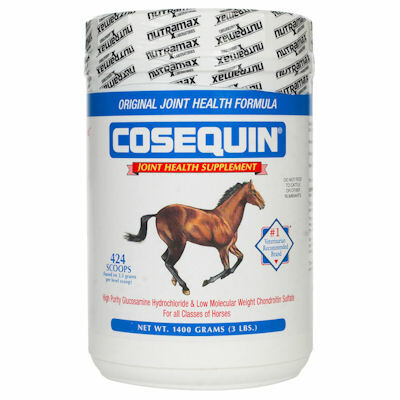 What can i expect from using Cosequin Equine Powder? Since Cosequin provides nutrients that affect the structure and function of the joint, changes may occur gradually. You should notice changes in 2 to 4 weeks in most candidates. Some horses may take 5 to 6 weeks to exhibit noticeable changes. The initial administration period is 4 to 6 weeks, however published research using Cosequin have shown an early response, in some horses, by 2 weeks. The response usually improves if the initial amount is continued for an additional 4 weeks. If a horse shows little or no response after 30 days, extend initial amount for 2 more weeks.